I have to admit that I am most excited to read The Children Who Lived in a Barn but it is a sign of my evolving tastes that I ordered not one but two volumes of short stories. I will not run out of books to read any time soon! There is nothing so beautiful as a pile of unread Persephone books! Children Who Lived in a Barn is such a fun read! It had me wanted to try cooking in a hay box. These are all fabulous choices though – Sherriff was a “new to me” Persephone discovery, and I like Laski there’s such much variety in his books. Ugh apologies for typos! That’s what comes of using strange keyboards in cafes! My first encounter with Sherriff was a bit humdrum but I think this will be much more to my tastes. And I cannot wait to start the Graham! What a great selection! Isn’t it nice to buy some books for yourself over the holidays? It is! Though I am rather fond of buying books for myself at any time of the year. Loved every single story in the Whipple collection, Claire. You will be thrilled with it, promise! Just try getting through ‘Wednesday’ without a sniff…have the tissue box handy. Note to self: buy a fresh box of Kleenex. Thanks for the advice, Darlene! I’ve only read three of these, and don’t remember anything about Greenbanks, but Tea With Mr. Rochester is lovely and thoughtful. I have read such glowing things about Tea with Mr Rochester that I really cannot wait to discover what I think of it! Those all sound promising of hours of pleasure! I’m thrilled to report that I received a Persephone yesterday, too. When I came in late last night I was pleasantly surprised to find that my husband had picked up the mail sometime during the day, and there, in a slim little packet, was Cheerful Weather for the Wedding, by Julia Strachey. Can’t wait to hear what you think of Cheerful Weather for the Wedding, Barb! It is one of my favourite Persephones. The tulips are gorgeous. The Persephones I can only sigh over from afar. I do love tulips (especially pink ones) and am so happy that they are starting to show up in the stores! Nice. Kind of like a Peploe painting. Is there EVER a danger of running out of things to read? I am a little green with envy here, not only for the books, but the tulips as well. The Children Who LIved in a Barn intrigues me – I should look into it, I suppose, but, for now, I will just enjoy the snow that is finally falling here. These are local hothouse tulips, Penny, so don’t feel too jealous. We’re still a month or two away from being able to pick tulips from the garden (though they are already starting to come up). I adore tulips, Danielle. As soon as they start showing up in the stores, I start buying them. They are too cheap for there to be any excuse NOT to have fresh flowers in the house! I’ve never bought a Persephone book before but I’m always so tempted! Happy savouring each read! I’ve been collecting Persephones for three years now and have amassed quite the collection. They are beautiful on the outside and always interesting on the inside! I’m so jealous. I’ve only just started my Persephone collection. I have three waiting to be read and Consequences on its way. Beautiful photo. I’d love to read their whole inventory! In NYC it’s an expensive proposition, though. It’s an expensive proposition in Vancouver too, Cynthia! I have been collecting them for three years now and have 56 of the 100 titles published so far. I love it too, Susan! 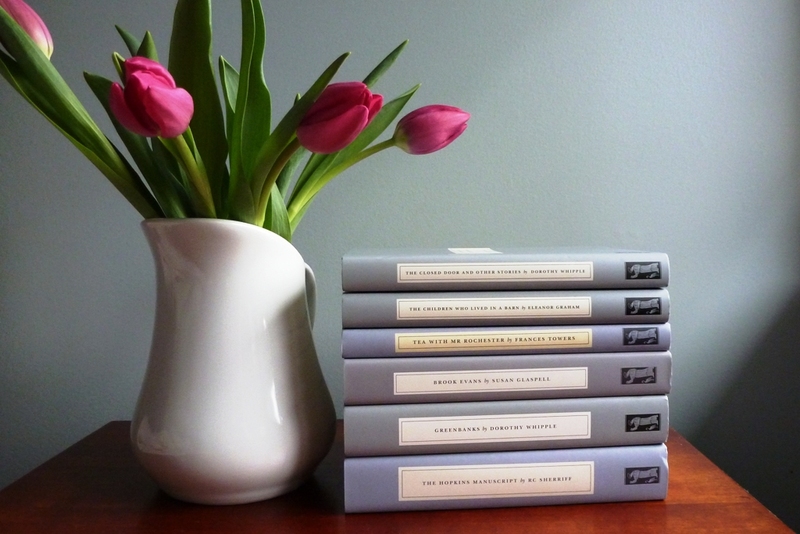 Pink tulips are my favourite to pair with Persephone books when I take photos – I love how pink and grey look together. Happy to hear you’re reading (and hopefully enjoying!) One Fine Day. Such a lovely picture and such a wise investment. Tea With Mr Rochester is, I think, the loveliest book of short stories i have ever read. Wonderful to hear another endorsement for Tea with Mr Rochester, Jane! I am really looking forward to trying it. on January 26, 2013 at 17:11 | Reply Karen K.
Great photo! I noticed your wall was almost dove grey. Coincidence? I think not!!! I’ve only read two of those, The Hopkins Manuscript and Brook Evans, and I loved both of them. I do have the other four on my bookshelves unread. (Hangs head in shame). Sort-of coincidence: the wall is pale blue but, when hit by the bright afternoon light (which is also the best light for taking photos), appears paler and almost grey, making it the perfect backdrop for photographing Persephone books! I have way more than four unread Persephones sitting on my shelves so don’t feel any shame on my account!